Then he said, “O LORD God of my master Abraham, please give me success this day, and show kindness to my master Abraham. 13 Behold, I stand here by the well of water, and the daughters of the men of the city are coming out to draw water. 14 Now let it be that the young woman to whom I say, ‘Please let down your pitcher that I may drink,’ and she says, ‘Drink, and I will also give your camels a drink’ — let her be the one You have appointed for Your servant Isaac. And by this I will know that You have shown kindness to my master. In the events leading up to this prayer, we see that Abraham’s servant had traveled over 500 miles to Abraham’s country and to his relatives to take a wife for Isaac. When he arrived at his destination, at the city of Nahor, the first thing he did was to park his camels by the well of the city in order to let them drink. As it happened, it was the time when the women of the city came out to draw water. And what do you suppose the servant did? I suppose most of us would have immediately tried to interview as many of the women as possible in order to find that perfect wife. But that’s not what the servant did. No, the first thing he did was pray. In this prayer the servant first asked for success in his search. Second, he simply reviewed the situation with the Lord. He said to God, “Behold, I stand here by the well of water, and the daughters of the men of the city are coming out to draw water.” The third thing he did in his prayer was to simply offer a request. Now how did the servant think to offer such a request? Well, the obvious answer is that it wasn’t him at all. It was God all the time, praying through him. Yes, the Spirit of God gave the servant the words to pray. He was simply obedient to His leading. 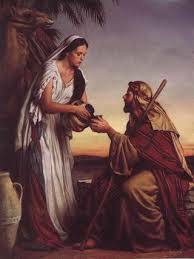 Then as the Spirit led him, he no doubt thought of what kind of a wife Isaac would want—a true servant like himself who would be willing to not only give him a drink, but his camels as well. So, as it happened, Rebekah, who was the daughter of Behuel, the son of Nahor, Abraham’s brother came and drew water for him and also for his camels. Thus Rebekah was the answer to his prayer. I think the greatest lesson we learn about prayer from this story is that we ought not to be so concerned about what words to pray, but just to pray from our heart and to always commit everything to God—as the servant did. This post is an excerpt from my book Service of Prayer. 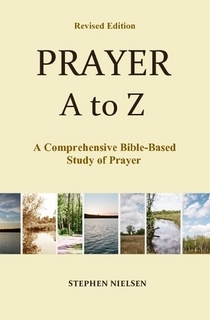 This entry was posted in Part 1, Abraham to Moses, Prayer A to Z Excerpts, Survey of Prayer and tagged prayer. Bookmark the permalink. Thank you so much, Stephen, for your faithful teaching on prayer … when I read your post, the servants faithfulness stood out so much. He trusted God with the answer… I pray God makes us those kind of servants, willing to pray and then faithfully trusting Him for the outcome… thanks for sharing!!! Yes, and he was a real servant, totally unselfish in his prayers. … a lesson I am still learning 🙂 thanks, Stephen!